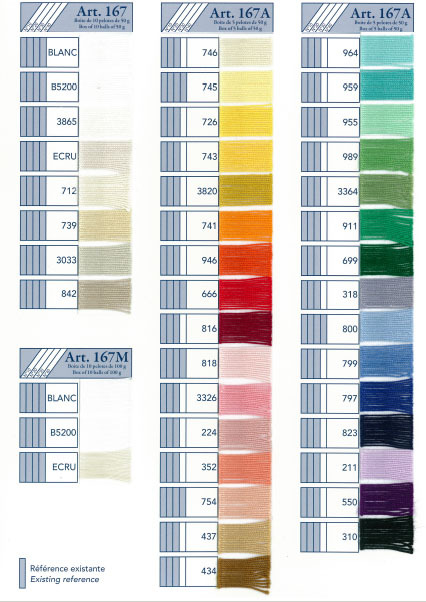 Dmc Cebelia Crochet Cotton Color Chart. DMC Cebelia is a superior quality crochet thread made from combed cotton. DMC Cebelia is 100% colorfast and fade resistant. During the manufacturing process, the thread is combed, singed by flame and then double mercerized. It is this double mercerizing which gives it its brilliance and strength. Cebelia is a 3-ply thread, 50 grams in a ball put-up. Made in France. DMC Cebelia Cotton is 100% colorfast and can be washed at 95° C/203° F. Chlorine proof. Can be tumble dried low. Do not dry clean. Can be ironed at low heat.